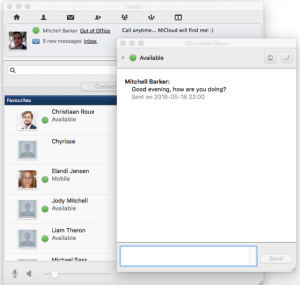 MiCloud offers the enterprise user secure chat services within the enterprise. The user sees the availability of other users in the contact list for messaging and is able to exchange real-time chat messages with other MiCloud applications. Text messages or e-mails can easily be dispatched to groups of contacts. By making a simple contact search and choosing to send either an e-mail or SMS to the listed results, they will all receive the same message. Individual contacts can easily be removed from the list of receivers prior to sending. The service is of course limited by the contact information available and the presence of e-mail applications or SMS services. If an SMS has been chosen, a dedicated message window will appear where the list of recipients can be edited and the text written. In case of an e-mail, the recipients will be added to the recipient list of a message created through the default e-mail application.